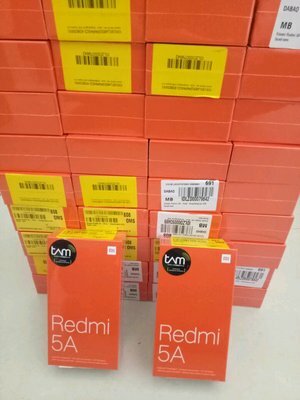 XIAOMI REDMI 5A 2/16 GREY/GOLD GARANSI RESMI TAM 1 TAHUN. BODY Dimensions 140.4 x 70.1 x 8.4 mm (5.53 x 2.76 x 0.33 in Build Front glass, aluminum body. DISPLAY Type IPS LCD capacitive touchscreen, 16M colors Size 5.0 inches, 68.0 cm2 (~69.1% screen-to-body ratio) Resolution 720 x 1280 pixels, 16:9 ratio (~296 ppi density). PLATFORM OS Android 7.1.2 (Nougat) Chipset Qualcomm MSM8917 Snapdragon 425 CPU Quad-core 1.4 GHz Cortex-A53 GPU Adreno 308. MEMORY Card Slot microSD, up to 256 GB (dedicated slot) Internal 16 GB, 2 GB RAM. Features Geo-tagging, touch focus, face/smile detection, HDR, panorama Video 1080p@30fps Secondary 5 MP, f/2.0 FEATURES Sensors	Accelerometer, proximity. -Pembelian Maximal jam 4 sore akan dikirim dihari yang sama. - Bila warna yg di pesan habis stok maka akan dikirim dgn stok yg ada.